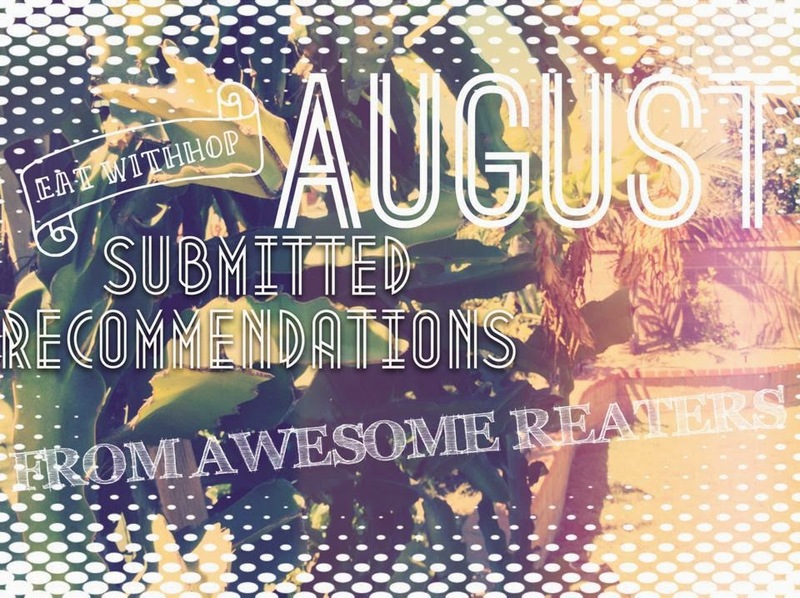 AUGUST 2014 SUBMITTED RECOMMENDATIONS BY YOU! - EAT WITH HOP! Home / DIARIES / RECOMMENDATIONS / Slider / SUBRECS / AUGUST 2014 SUBMITTED RECOMMENDATIONS BY YOU! P.S. IF YOU DIDN'T ALREADY KNOW, "REATER" = READER X EATER. THAT'S YOU GUYS! Oh My Pan (San Gabriel)- Amazing brick toast! Also a bakery and tea house. Potato Corner (Arcadia)- it's located inside the Santa Anita Mall, but there are other locations (Cerritos, Glendale, Santa Monica) The BEST seasoned fries. Dips Grill (Alhambra)- Vietnamese/American fusion; go during happy hour. Bulgogi House (Rowland Heights)- $10 AYCE KBBQ. Less crowded than LA. Cha Cafe (El Monte)- Asian/American fusion. Their kobacha fries, cheesesteak fries, and special sauce are addicting! Also try out their frozen horchata with boba. Factory Tea Bar or Tea Brick (San Gabriel, Monterey Park)- my favorite tea houses. Both have great boba. FTB has my favorite brick toast. Night Owl Cafe (Temple City)- the newest hype. Waffle + ice cream bowls. Macchiato (Monterey Park)- face/ tea lounge. Ice cream macaron sandwiches + other desserts. Love to Go (San Gabriel) - dessert waffles + cafe style drinks. Grill 'Em All (Alhambra)- crazy amazing death burgers and sandwiches. You need to look this up for yourself. Savoy Kitchen (Alhambra)- If you like Hainan Chicken, you'll be blown away! The wait can get tedious, but you can order for take-out. Also try the chicken pasta with cream sauce. It sounds typical but the Hainan chicken gives it that kick. Wow! Thank you so much Cicely! I love all of Cicely's suggestions! Because I am not very familiar with the LA County area, this list of suggestions is truly helpful! Now I know all the hotspots to check out thanks to Cicely! I hope this is also useful for you Reaters out there too! Factory Tea Bar: I personally think the drinks are too sweet and the boba too. But I love how perfectly chewy the boba is! And you can always just adjust the drink sweetness! Love To Go: This place is amaaaaaaazing! I went here a few weeks ago and the latte art is so intricate and unique! The drinks might not be as hot as some may want it to be (for hot drinks) because it does take time to do the latte art, but the drinks are still very enjoyable and the right temperature for you to be able to sip right away without burning your tongue! They also can do 3D latte art for cold iced drinks as well! Potato Corner: I absolutely loooooooove this place. Cicely is right! Best seasoned fries ever! I love this place because it reminds me of the Calbee store in Japan. Calbee in Japan has a chips/french fries chips brand but at the actual store, they fry all of those chips fresh for you. A unique item on their menu in Japan is freshly fried chips with chocolate drizzle. Anyways, as for Potato Corner, they also make it fresh for you and it is absolutely amaaaaaazing! Noodle Station because it has Garlic Noodles, Hot Pot, Katsu and much more! Thank you Mr. Meow Meow! Cool nickname! I couldn't find the yelp page for Noodle Station for some reason but I gotta tell you, it sure sounds interesting! I pass it all the time when I drive down Beach Blvd! It's in the same plaza as the Thuan Phat Supermarket too!